Olivia L. Carrescia has worked as a researcher, producer and editor for the past 25 years in the U.S and Europe. After receiving a B.F.A. from the Cooper Union Art School, she worked on major feature films in Rome, Italy and later on cultural documentaries for RAI-Italian TV, BBC, and the award winning children's television program, "Big Blue Marble," in the U.S., Europe and Latin America. Her first independent film, "Todos Santos Cuchumatan" won a Blue Ribbon in Anthropology and Ethnography at the American Film Festival in 1983 and aired on public TV in the U.S., Germany and Australia. Her second film, "Todos Santos: The Survivors," won a Blue Ribbon in International Affairs at the American Film Festival in 1991. "Mayan Voices: American Lives" completed the trilogy in 1995. 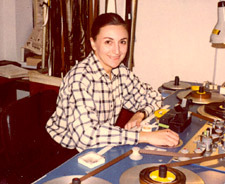 All three have been distributed internationally and are owned by every major university and Latin American Studies Film collection in the U.S.
Carrescia was awarded a John Simon Guggenheim Memorial Fellowship in filmmaking in 1996. She has received three NYFA Fellowships and numerous grants from NYSCA, the American Film Institute, the Jerome Foundation, the Soros Open Society Institute and others. Her more recent films include "Diamonds in the Dark" about women in Romania, and "Dan's Class" about a unique third grade teacher. Her latest documentary, "Sacred Soil," describes the work of the Guatemalan Forensic Anthropology Foundation which is still uncovering the remains of thousands of Mayan Indians who were massacred during the 1980's. She is currently a teaching artist with non-profit arts organizations in New York City. Todos Santos Cuchumatan - This film provides an intimate look at everyday life in Todos Santos, a village in Guatemala's highlands, before the violence of the 1980s. Todos Santos: The Survivors - Demonstrates how the political turmoil of the1980s affected this once quiet Guatemalan village.